Reveille, the "First Lady of Aggieland", is the official mascot of Texas A&M University. She is the highest-ranking member of the Corps of Cadets with five diamonds (making her a Cadet General) on her blanket; in comparison, the Commander of the Corps of Cadets has only four diamonds. Oh, and Reveille is a dog. 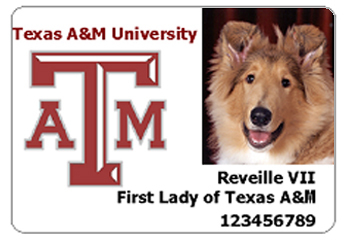 The First Lady of Aggieland and the highest-ranking member of the Corps of Cadets is a Border Collie. The mutt who eventually became Reveille I first arrived at TAMU 81 years ago, in January of 1931, after a group of cadets found her on the side of road and brought her back to campus with them. Despite the fact that dogs were not allowed in the dorms, the students hid her overnight in their room. The following morning, when Reveille was played, the dog began barking and earned her name. 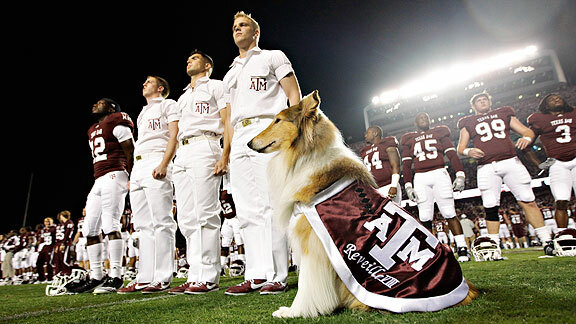 The following fall, when the football season began, Reveille was named official mascot of TAMU and led the band onto the field for their halftime performance. 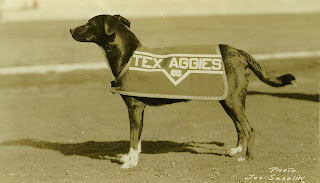 When Reveille I died on January 18th, 1944 she was given a formal military funeral on Kyle Field and buried at the North entrance of the field, facing the scoreboard so that she could keep track of how the Aggies were doing during their games. Eventually Reveille II, III, IV, V, and VI were buried alongside their honored namesake. Reveille II, a Shetland Sheepdog, was donated to TAMU by an alumni eight years after Reveille I passed away and served her school from 1952 until 1966. During her tenure, the tradition of the mascot being escorted by a member of the Corps of Cadets at all times began. Reveille VII - the "problem child"
Today Reveille VIII, who was introduced on August 30th, 2008, is cared for the Corps of Cadets Company E-2, nicknamed the "mascot company". A sophomore member of the company, known as the "Mascot Corporal" is responsible for Reveille at all times - as I mentioned above, Reveille is always escorted. Freshman are required to address her as "Miss Rev Ma'am". She is the only dog, with the exception of service dogs, allowed in campus buildings, and she has her own cell phone (operated by her Mascot Corporal) and Student Identification Card. Tradition states that if Reveille jumps on a Cadet's bed, the Cadet must sleep on the floor (thought this tradition may have just applied to Reveille I, who lived in the dorms). 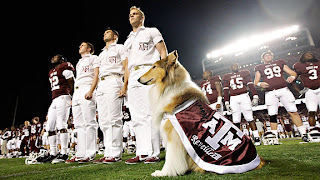 Tradition also states that if Reveille barks in class (remember, she's always escorted, which means she attends classes with her Mascot Corporal), class is cancelled. I'm a little obsessed with Reveille, to the point that I may or may not have freaked out and embarrassed my husband when I saw and took pictures of a border collie - who was NOT Reveille, by the way - walking around on campus. 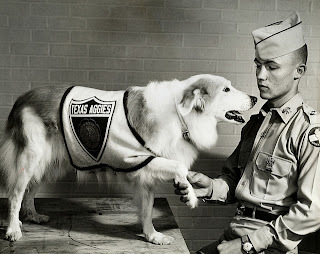 And while Tom is not at all obsessed with this famous dog the way I am, he's crossing his fingers that one of these days the Mascot Corporal - and therefore Reveille - will be in one of his classes. He's perfecting his methods of getting a dog to bark...and practicing throwing up his hands in exaggerated frustration when he has to cancel class. omg i think i found my dream job - following a dog around all day. 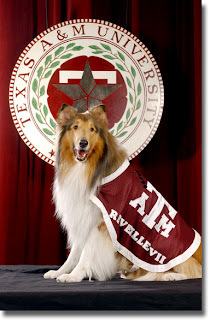 Reveille VII passed away today. Wonder why she was called "the problem child"?